Ottawa Senators head coach Dave Cameron has come under fire lately for some player usage decisions that have left many fans scratching their heads. In Tuesday's game against the Panthers, Cameron moved Mark Borowiecki to forward as the defensive defenceman even saw some time on the team's top line. Cameron met with the media today and elaborated on some more changes for tonight's game against the Lightning, "We made some adjustments because the boys were just getting a little too risky last game. If you hate risk, you're going to love tonight's lineup." "I think Bobby [Ryan]'s been playing a little too risky lately. I want to give him some space and drop him down to be our seventh defenceman tonight. Greening should draw into his spot tonight. I didn't like the risks I saw Methot taking last game either. So I'm moving Anderson up to play with Karlsson." When asked who would be playing in goal, Cameron replied that the team's goalie coach had suggested a friend whom he had been assured is not at all risky. Cameron seemed surprised when asked what sorts of things he considered to be risky. "All kinds of things, really. Taking too many shots, making dangerous passes, carrying the puck, making regular passes, skating backwards. These are all examples of bad habits that are working against us here. Which is why Mark Fraser will be centering the top line tonight. I call him Mr. No Risk. Also, his localness is off the charts." Unprompted, Cameron then produced what appeared to be a large Bristol board with the Senators' top scorers listed on it. 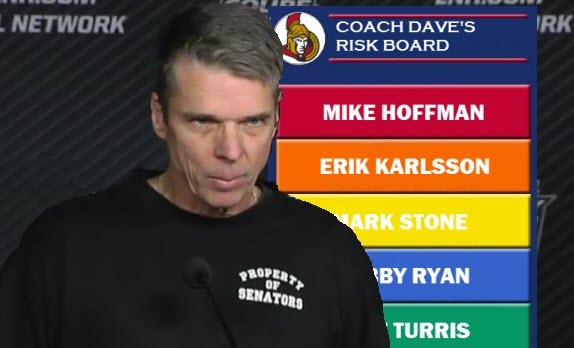 He explained it's called the Risk Board and started pointing at the names on it, "Kyle Turris: risky. Bobby Ryan: super risky. Mark Stone: risky factor ten! Mike Zibanejad: CODE RISKY! Erik Karlsson: Riskier than tap dancing on the surface of the sun. Mike Hoffman: I am literally risking my own life and the lives of everyone in the Canadian Tire Centre every time I send him onto the ice. Just indescribably risky." The coach deftly evaded questions about how it was even possible to have a defensive pairing of Eric Gryba and Bryan Smolinski, simply advising the media to not worry about it. "And yes, before you ask, I did consult with Father Muldoon on these lineup changes. That's why he's playing left wing tonight." "I've said it before: I am going to be fired..." The media waited for Cameron to finish his sentence, but he just walked away, concluding his media availability.